These gorgeous Laminated Paper Carrier Bags are available in both gloss and matt finishes and are perfect for shoe or clothing boutiques, or indeed any retailer who wants to add an extra touch of elegance and class to their brand. Want to check the outstanding quality for yourself? Simply purchase a sample! NB Samples may be sent via courier or Royal mail depending on quantity ordered. This is the reason for the higher price. Please be aware that a feature of the matt finish is that it is prone to scratching. 100% print with a matt lamination. Reinforced top and bottom to the bags, made with 350gsm duplex board; ideal for carrying heavier weights. Most commonly used in retail stores, clothing boutiques, shoe boutiques. Perfect for holding heavier items. 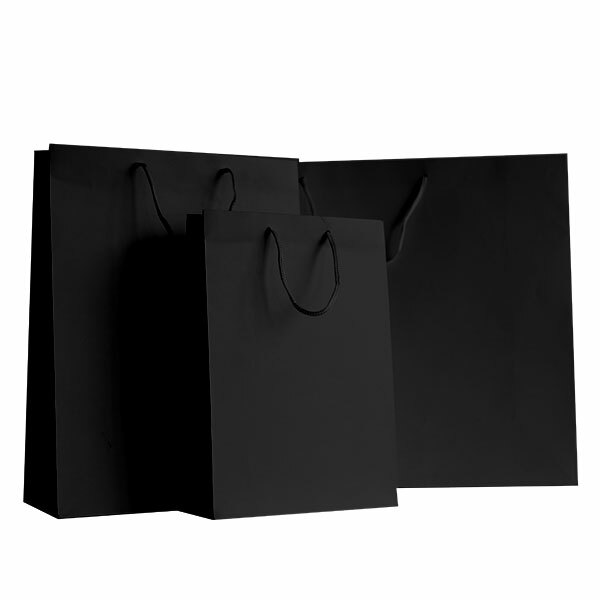 Our stock of Laminated Luxury Bags are made from top quality paper and are capable of holding heavy weights, we are able to overprint them with your chosen design.